Mile Hi Distilling: A Case Study. Mile Hi Distilling has been a client of ours for almost 1 year. So we decided to document their progress to demonstrate what we were able to accomplish. This has been a very fun project and we've been extremely happy with the results. We're not the only folks who are happy. "The constant check up with our company and the health of our site is proof of the dedication Presence Media has for making things better. Will be recommending Presence Media to anyone looking for help with their site." In this post we'll go through the core efforts that led to the success of this project. Every client varies significantly in what they need to achieve results. Accurately assessing these needs and prioritizing different opportunities is the key to a successful campaign. We always want to grab the lowest-hanging fruit first. For example, we might estimate that we can move from spot 4 to spot 1 in Google for a keyword if we spend 100 hours building links. That effort might give us 400 extra visits per month. Alternatively, we can target 10 new long tail keywords if we spend 100 hours. These 10 keywords might bring in an extra 2000 visits per month once ranking. Our priority now becomes clear, we can get 2000 extra visits per month with 100 hours of work vs. 400 extra visits. 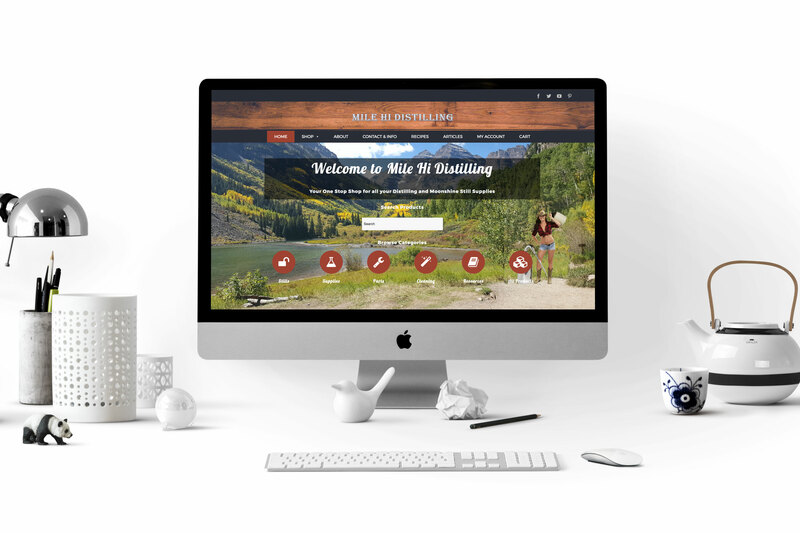 To kick off this project, Mile Hi Distilling requested a full site redesign. The old site was built on a WordPress theme that was no longer being supported by the developer. It was a 600+ page hairball of plugins, artifacts from previous iterations of the site, and frivolous http requests. The site took about 16 seconds to load and completely lacked any meaningful on-page search engine optimization. This was the case even though Mile Hi had an agency they were paying every month to optimize the site (not uncommon in this industry). We decided it would be best to scrape the old site and start fresh. Being an e-commerce site with over 600 products, we knew we had our work cut out for us. We worked with the team at Mile Hi to draw up a general design they liked and got to work. After 3 months of building the site was ready to launch. In SEO, the hare always wins. One of the major issues Mile Hi was getting complaints about was their website's load time. The site was parked on a server that was excruciatingly slow. To make matters worse, access to that server was being held hostage by a previous agency. Mile Hi Distilling's owner was at wit's end trying to solve the problem. He had gone through several companies that were promising solutions, none of whom could deliver. This story should be surprising to us, but its not. It is common for agencies to charge high prices for little to no value provided. Performance doesn't stop at a good server. Once development on the site was complete, the process of optimizing for page speed began. The way we approach this process varies significantly from project to project. The key here is identifying your site's existing bottlenecks and getting to work rectifying them. Expires headers added to .htaccess to instruct browsers to cache static assets. Compressed all images to optimized file sizes. Resized any images necessary to avoid serving scaled images. Moved scripts to the footer to avoid page render-blocking. Loaded Google JS from Google libraries. Removed query strings where possible. To demonstrate the effects of this effort, we recorded Mile Hi's users while they were using the site before and after implementation. We see page speed being overlooked by almost every new client we bring on. This is understandable, it's often an elusive problem to solve and its benefits are not obvious. To clarify this issue, we'll show the two main benefits Mile Hi saw from this effort. The first thing we saw was a major increase in rank across the board, for every keyword in Mile Hi's profile. This translated to a steady increase in organic traffic. 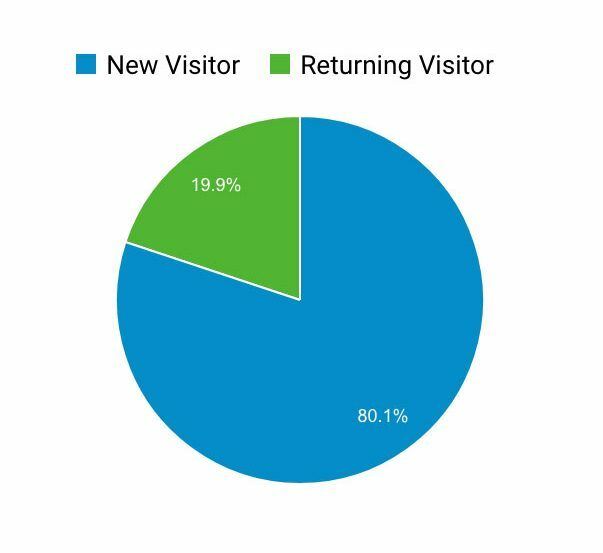 The next thing we saw was a doubling of the number of new visitors we were able to retain as recurring traffic. Apparently if your site loads fast enough to not evoke fantasies of clawing one's own eyes out, people are likely to return. 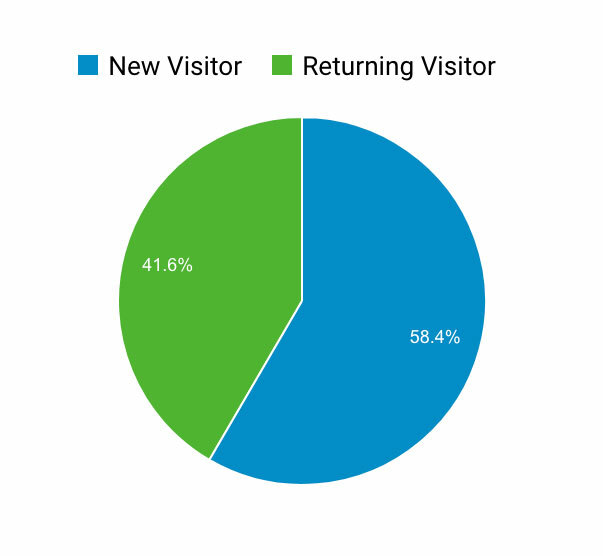 Returning visitors shot from 20% up to 42% of the overall traffic on the site. This being on top of an already increasing new visitor count. This was an extremely powerful effect. 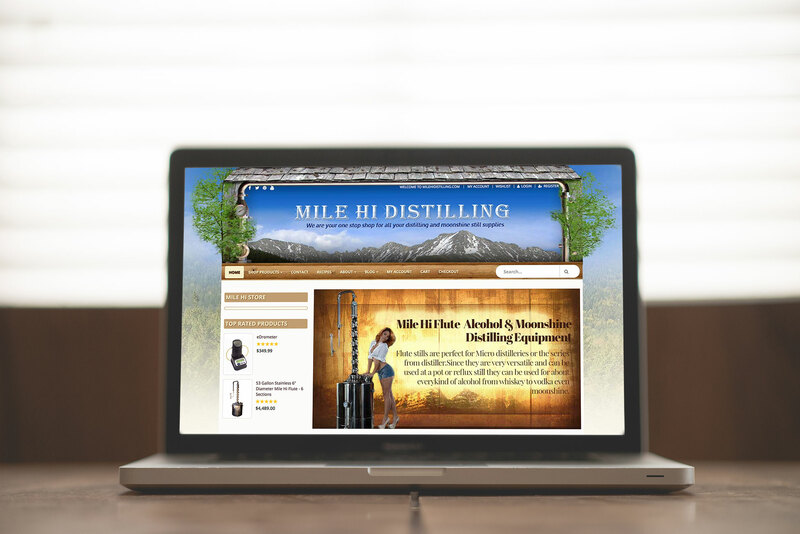 The new and improved Mile Hi Distilling website launched at the end of August, 2017. The next phase of our project was the portion we were the most anxious to prove ourselves on. After extensive research into the market, competitor SEO strategies, and keyword opportunities we saw numerous improvements available. So at the beginning of September, 2017 we got to work. Mile Hi Distilling has a sales cycle that is heavily seasonal. Their sales increase significantly from Fall through Spring. Because of this, it's necessary to compare their 2016-2017 busy season (before we were hired) to the same part of 2017-2018. This was mostly achieved through content marketing and guest posting on other blogs. We knew nothing about distilling moonshine, in fact we didn't even know what moonshine was, exactly. (It's Whiskey that's illegally distilled from an heirloom corn mash, typically in a copper or stainless steel reflux still... technically...) But we didn't let that stop us, we educated ourselves on the subject and produced a long-form guide on how to distill hooch from a corn whiskey mash. The article was well-received and attracted multiple backlinks from other bloggers immediately. After some hard work producing a good piece of content it was time to get it ranking for "How to Make Moonshine." It's important to note that for higher-volume keywords like this, it takes at least 2 months for a new page to rank (assuming you're doing everything right). During this time, we made regular updates to the article to keep the content "fresh" in Google's eyes. We also worked it into our outreach campaign for Mile Hi's backlink acquisition efforts. 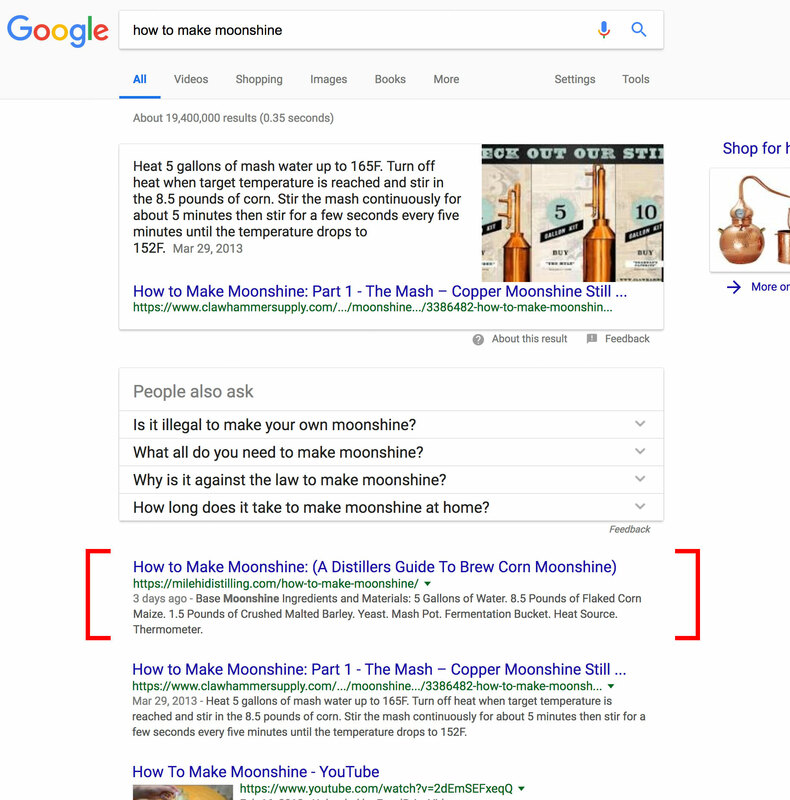 After a few months we had attracted 9 unique referring domains to the article and are currently holding the #1 organic position for our main keyword target, "How to Make Moonshine." This keyword has already made a massive impact on Mile Hi's bottom line and we're not even to the featured snippet section yet. "How to Make Moonshine" is one of many targets that we are currently working on. This situation is not a fluke, it's simply SEO in action. Hopefully, however, it has done its job in demonstrating our approach and the results that ensue. As stated earlier in the article, every client is different. That being said, our approach remains relatively consistent. First, we thoroughly assess the project at hand with obsessive attention to detail. Next, we identify the low-hanging fruit that will provide the biggest gains for the least amount of effort. Finally, we plan and execute to achieve the opportunities we've identified, then start all over again. We hope this case study was helpful for you. We believe it's important for people to see that big results are possible. Whether you intend to hire an agency like us or implement things on your own, knowing what's possible can go a long way. Consistent hard work will get you results, it's all about fidelity to the effort.